Portugal's Douro River winds its way through towns that have somehow managed to preserve their distinctive culture, and way of life, while the world all around them has succumbed to change. From elegant Lamego to Regua and Vega de Terron you'll find that people still ply the trades people always have in the historic pockets of the Douro Valley. The vineyards that grace the banks of the Douro are worked the way vineyards in the region always have been. The wines they produce, from the many highly loved varieties of port, to their fine unfortified reds and whites, are as rich and plentiful as ever. The fare is as honest and as delicious as it was in days of yore. And, most refreshing of all, the communities are every bit as friendly, and as welcoming. Choose from a selection of ways to travel to Porto. Fly from one of up to 5 UK airports. On arrival into Porto airport you'll be met and transferred to the luxurious Scenic Azure where a warm welcome awaits from your crew. Today, discover historic Porto, including a visit to Palacio do Bolsa. Then enjoy an afternoon of cruising as your Space-Ship makes its way to Entre-os-Rios..
Freechoice: Tour Guimarães, the seat of the first King of Portugal, dating back to Medieval times. Alternatively, choose a tasting at the fairy tale-like property of Quinta Aveleda, a renowned regional sparkling wine producer. This afternoon, enjoy a blissful cruise to Régua. Sundowners: Exclusive to Scenic guests, soak in the views of Régua's surrounding vineyards at a cocktail event hosted on the beautiful terrace of the Douro Museum. Savour a range of port wine varietals in the most wondrous setting - and be sure to try the Port Tonic. Freechoice: Tour the town of Lamego or enjoy a guided visit of Mateus Palace. This afternoon, visit the Varosa Valley and the village of Tarouca. Explore the restored Monastery of Saint John of Tarouca and walk the fortified bridge of Ucanha, Portugal’s first toll bridge. 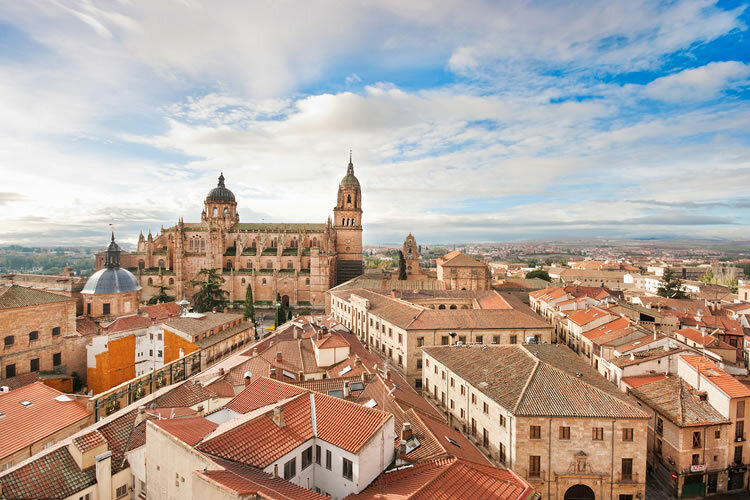 Absorb the architectural splendour of Salamanca. Enjoy an included lunch accompanied by a Flamenco dance performance, before some free time to explore Salamanca. Freechoice: Visit the Côa Valley Museum. The more adventurous can take a canoeing excursion on the Sabor River. Alternatively, visit Casa Painova for a sweet almond workshop and a tasting. This afternoon, enjoy your cruise to Pinhão. Today, visit the village of Provesende. Exclusive to Scenic guests, wander the streets of this quaint village, visit the church for a recital, and enjoy wine tasting at the restored manor house of Morgadio da Calçada. Enjoy an exclusive Douro Valley Wine Review and a cork jewellery workshop on board. Alternatively, simply enjoy the beauty of the region as you cruise back into Porto. Enrich: This evening, enjoy a dining experience with a traditional Fado music performance at Burmester Cellars. Meet the fishermen of Afurada village as they prepare their catch for you, paired with a chilled glass of wine.